I know... 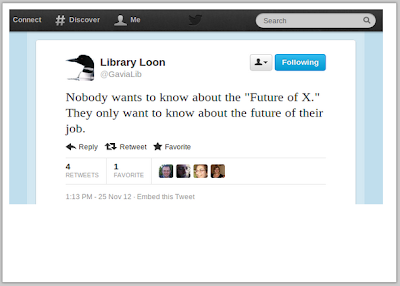 I know... another post about the future of libraries. But this one is different from the talk I gave before. 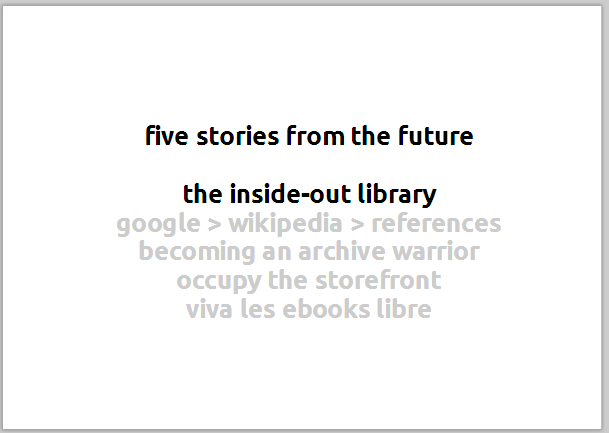 It's shorter; it geared towards an audience of non-librarians; it uses different stories; it betrays more of the form of a larger idea that I'm working on. And it has a different ending! 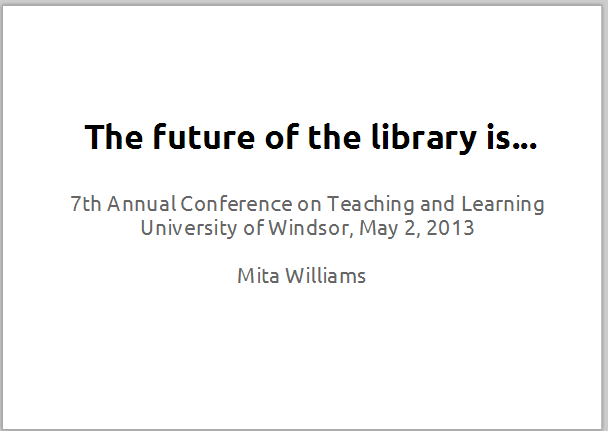 This presentation was for the Seventh Annual Conference on Teaching and Learning, held at the University of Windsor, Windsor, ON, May 1-2, 2013: On the verge: debating the future of university teaching. 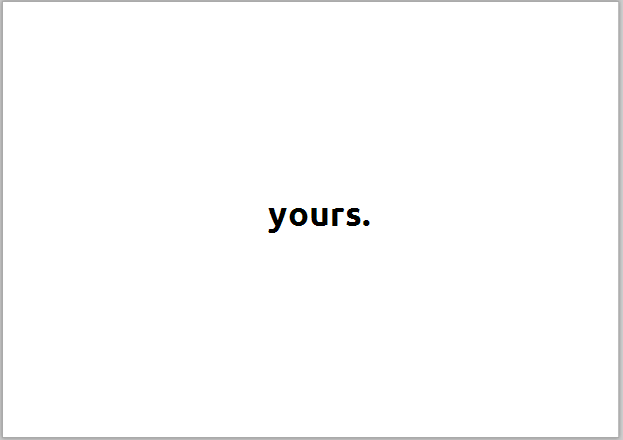 Let me start with a caveat. I'm a librarian. 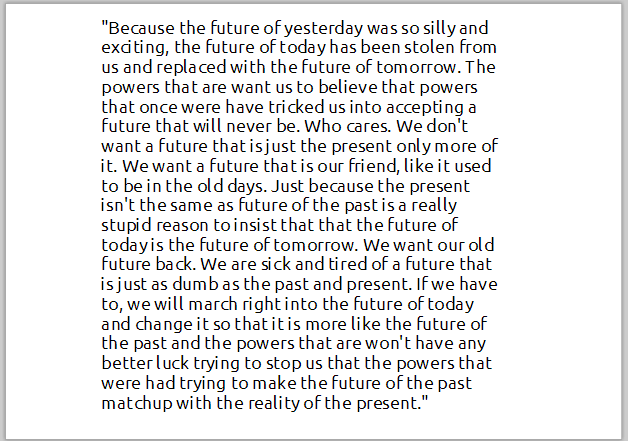 I am not a futurist. So I'm not standing before you to tell you that I have soothed the future. But I will say that I have been looking for the future of the library for some time now. And I think I've seen glimpses of it. Here’s a quotation from David Farrar, vice-president academic and provost of UBC, from an article entitled Turning a Page: the changing role of the university library. 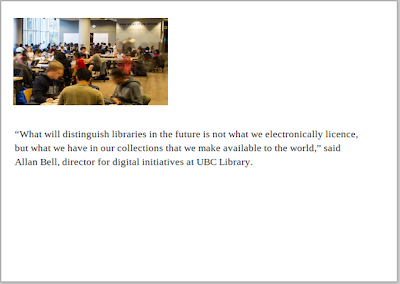 And what he's describing is happening at almost all academic libraries: collections are either being digitized, move off-site into storage, or just "deaccessioned" to make room for group study areas for students. 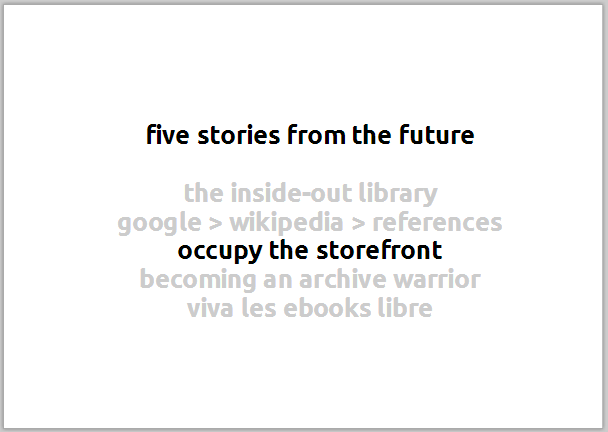 That is the future of the library as it is unfolding in the present. But the library of the future has to be more than a desk and a chair, access to the Internet, and an outlet to plug in a computer. Doesn't it? I think so. And my talk today are about those negotiable alternatives. 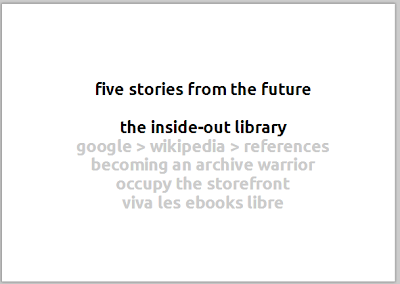 And to do so, I will tell five short stories. For many of our researchers, the library has become not so much of a space but of a border between territories. Librarians, as such, have become border guards. 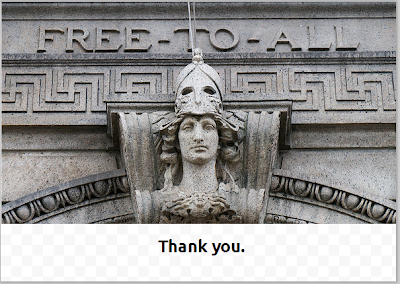 Give me a proper ID and password, and I will allow you to pass into the lands of JSTOR. Meanwhile, the public library has largely become a point in space for many of us. When I'm at home, I go online and order the books that I'm interested in reading. When they are available, the library lets me know by email, and then I drive to the branch, park outside, swoop in and grab my books and leave. In response to these behaviours, libraries are investing in comfier chairs, group study areas, collaborative working zones, and even media and technology labs. 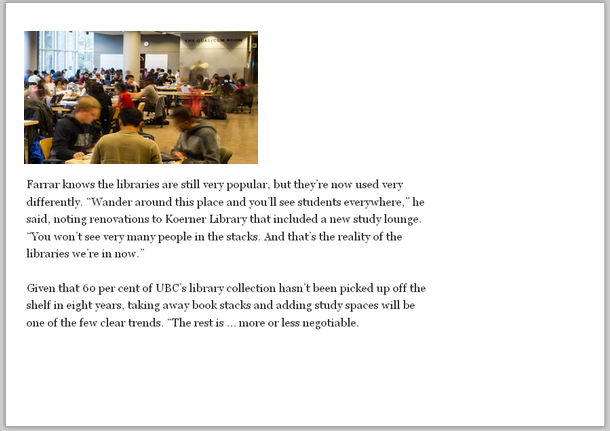 We are investing in our spaces so that the library can become a stronger collection of... people. It’s as libraries have been turned inside out. But what about our larger mission? 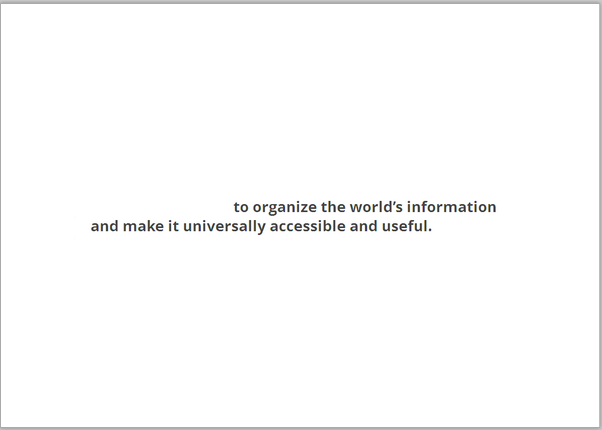 Isn't our mission to organize the world's information and make it universally accessible and useful? 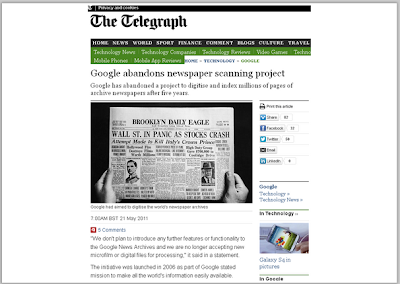 Bear in mind that Google's mission statement doesn't apply to the world's information that comes in the form of printed newspaper. Google won't help you there. Which is too bad because so much of our history is captured in historical newspapers. Luckily for all of us, Art Rhyno of the Leddy Library works where angel investors fear to tread. 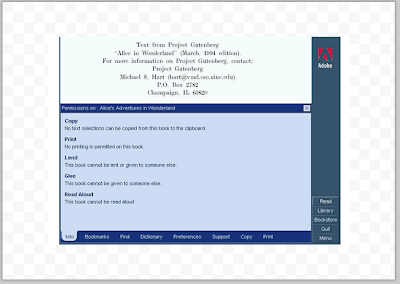 Art makes use of open source OCR (optical character recognition) software running on unused library computers to give digital images search-able text. Art's work with Our Ontario - now called 'OurDigitalWorld' - has helped create the 4th largest collection of digitized historical newspapers in the world - and it includes many newspapers that are crucial sources of understanding of our own history in Essex County, such as Voice of the Fugitive. 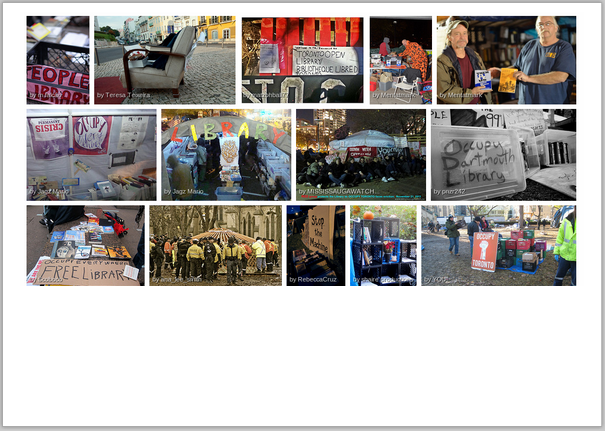 What if instead of trying to bring the community to the library, we brought the community to the world? 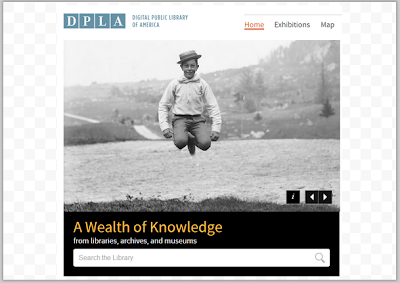 What if instead of being concerned with lending, libraries made the shift to sharing? And we move from Google to Wikipedia. Just like our students. 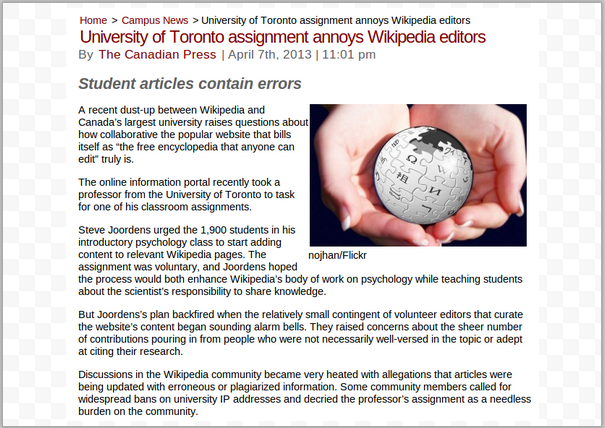 We understand that our students use Wikipedia but evidence suggests we probably underestimate how much they use it and depend on it. 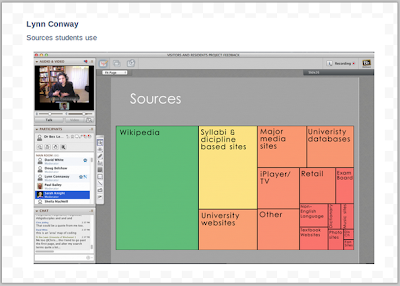 "In simple terms students personal use of the internet is generally very effective for their education but they are nervous that their practices are not valid and don’t reveal them to their tutors. The messages or lack of messages from educational institutions on these practices is generating a learning black market which masks the sheer scale of these new modes of engagement." Speaking of outdated preconceptions, how many of you saw this story last month? An optional assignment to add research to Wikipedia from a first year intro to psych class from U of T backfired when the Wikipedia editors complained that they were being overwhelmed poor quality work from students. I like to think that just like academia, Wikipedia needs librarians. And librarians need Wikipedia. We need it because it is where our readers are. We need it because it’s a gateway that connects our readers to the subjects that would like to learn more about - and we need to connect those subjects with the sources that we offer. 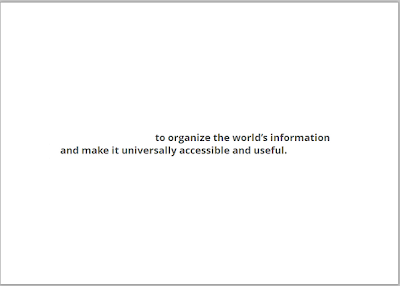 We need Wikipedia because it provides a platform of information without the undue influence of advertising. We need it because unlike most for profit mainstream media outlets, Wikipedia reveals the contestation of knowledge as much as knowledge itself. 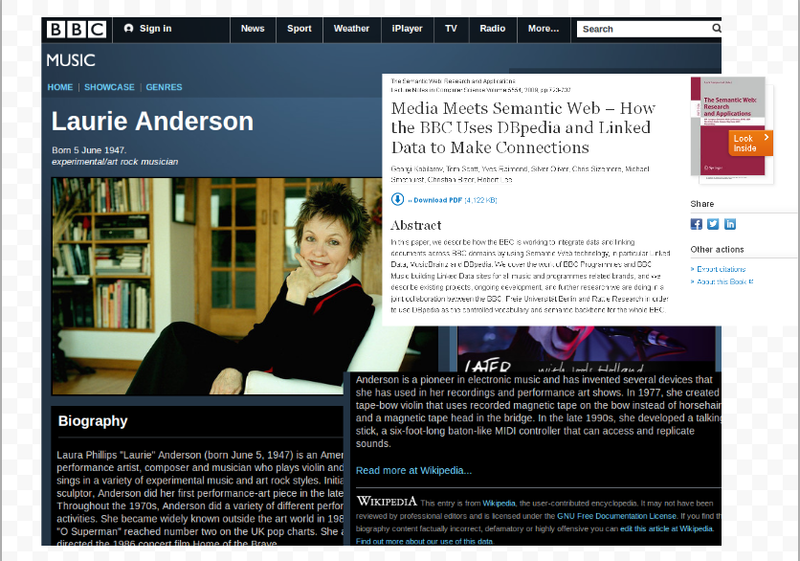 It's not well-known but behind Wikipedia is something called DBpedia which provides structured linked data that can be re-used and re-purposed. 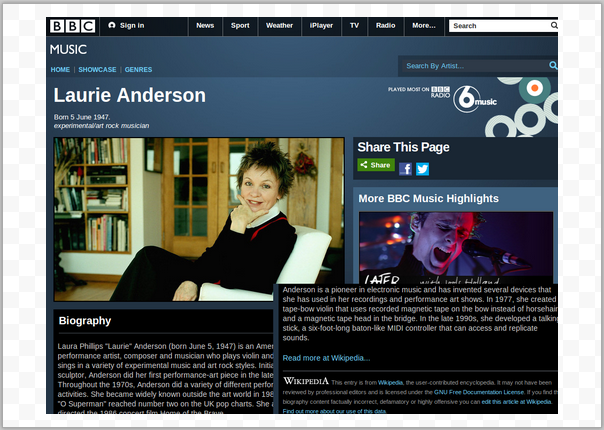 Here is a simple example from BBC Music where they use information from Wikipedia to populate their site in an organized way. 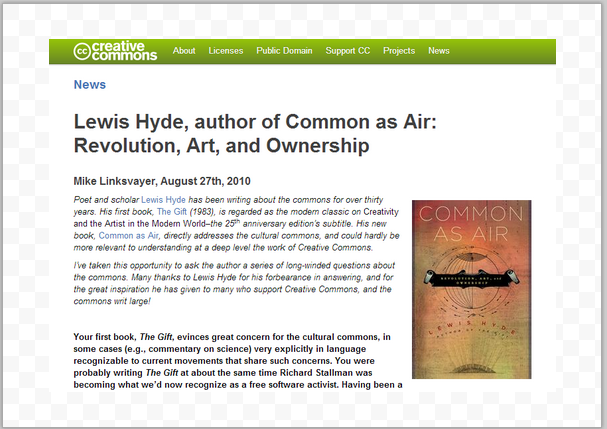 Linked Data is an opportunity for cultural institutions to provide structured, authoritative and organized information that our communities - that being our researchers, teachers, students, and programmers - can build upon. 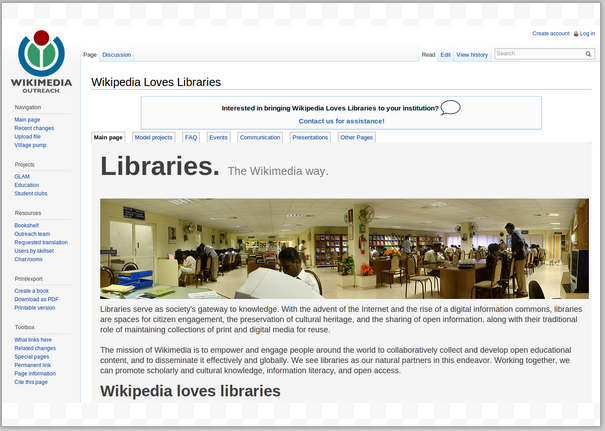 We need Wikipedia because it provides this free and open linked data when our vendor supplied library systems do not. You may notice some of the icons in the map are red. These markers designate those Wikipedia entries are currently lacking a image to illustrate its page entry. Wikipeda now has an app that you can run on iPhone or Android device that allows you to easily take and donate license-free images to the Wikipedia Commons for use in Wikipedia and for anyone else. 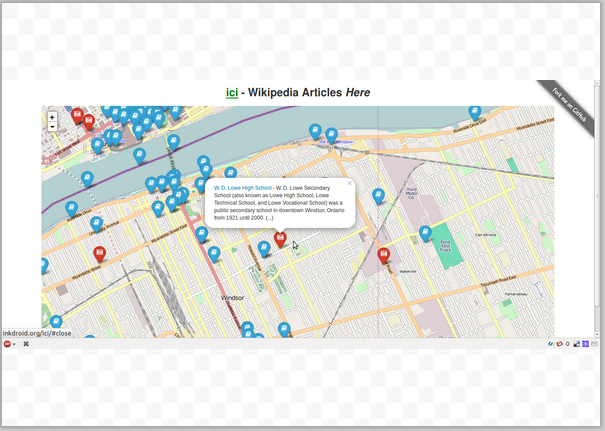 With that app and Ed's ici page, you can now walk around town with your smartphone and easily find ways to make Wikipedia better for everyone. Now, I recognize that the map is not the territory. But the map of knowledge that has the best scale of representation of the interests of our own territories is Wikipedia. 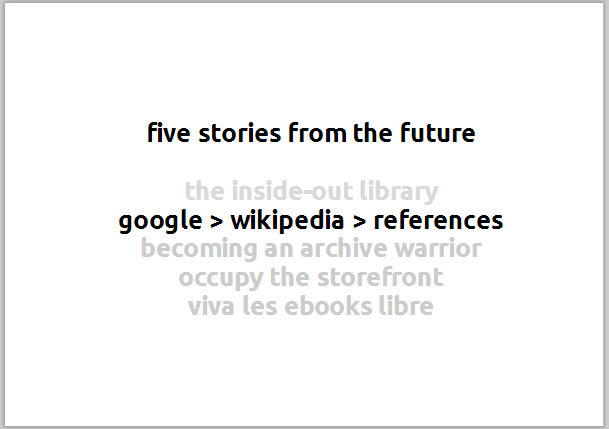 And with the rise of mobile devices, Wikipedia allows us to access information in situ in a way that no library can. 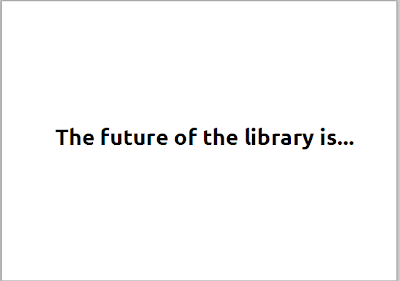 Unless the library itself is mobile. Which brings us to Story Three! 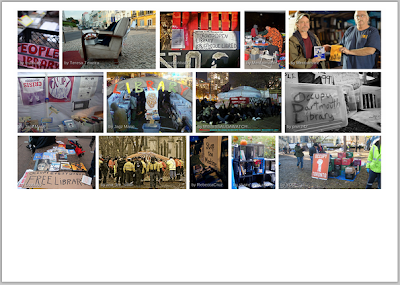 The Occupy movement surprised many of us. 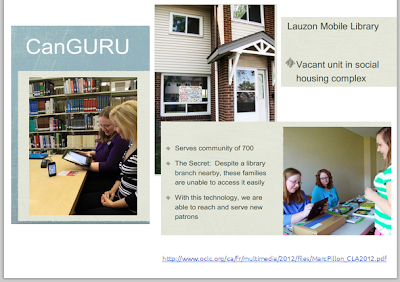 As did the emergence of so many People's Libraries. Why were libraries seen so important to the Occupy movement while it seemed we were continually told that our “brand” is no longer compelling? Other libraries are emerging from strange spaces as well. 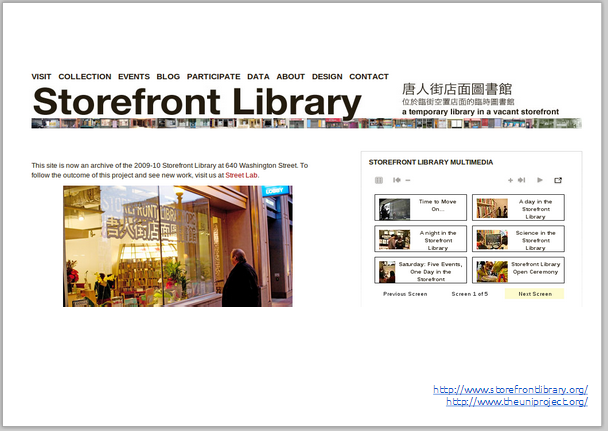 In 2009, a temporary 'Storefront Library' was established by Street Lab in Boston to demonstrate the potential impact of a library in the neighbourhood. 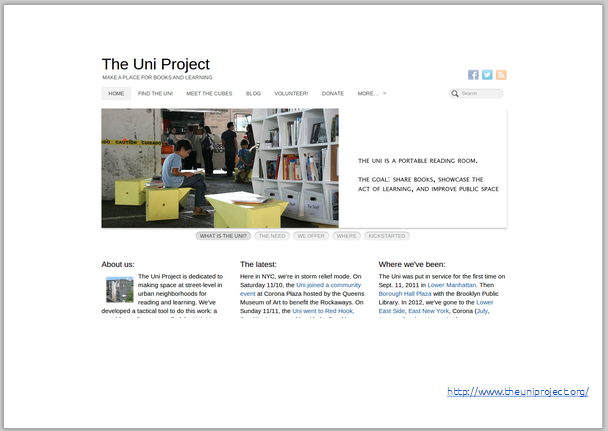 The team behind the Storefront Library in Boston then went on to design "The Uni Project" to allow them to create temporary reading space that could be established in public spaces both inside and out. Recently, the Uni Reading Room has been touring the areas most affected from Hurricane Sandy as tens of thousands are still homeless after last October's epic storm. I have been collecting examples of these vernacular libraries. Some are they are intended to be temporary. Some aspire to exist as long as possible. Some they are community-run. 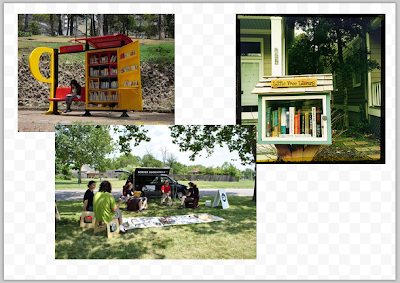 Some - like Lee Rodney's Border Bookmobile - are literally artist-driven. 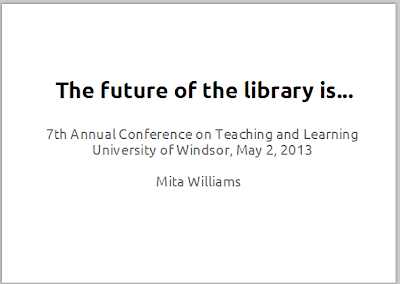 At the Windsor Public Library they are trying to provide an "Apple Store-like experience". So they removing the desks and library staff now help readers find then borrow materials through the use of an iPhone, a bar code scanner and an iPad. With this same technology, they are now able to establish temporary library branches, and in one case, establishing one in a neighbourhood where the residents could not get to the library - even though there was a branch only blocks away. A librarian visits weekly with a small set of material that she brings with her that they request and with what she knows they might enjoy, based on her previous visits. The librarian is the branch. Speaking of which, in this room is my PirateBox. It's a router that provides wifi and costs about $30. Although it's really much more than that. "PirateBox is a self-contained mobile communication and file sharing device. Simply turn it on to transform any space into a free and open communications and file sharing network." 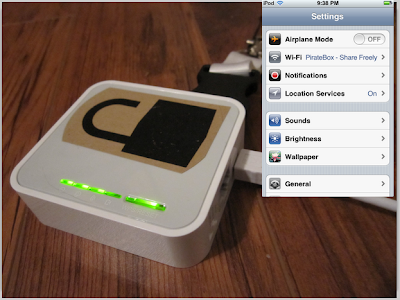 Translated, a pirate box allows you to share files without being connected to nor monitored from the Internet. Now, if the word Pirate makes you nervous, please be aware that there is a very similar form of this project called LibraryBox that does essentially the same thing as a PirateBox. I too am a library. We tell our students to be careful of what they put on the internet because putting information on the internet means it will exist forever. And that’s not exactly true. Many websites, even those owned by profitable companies (like Twitter) will shut down sites filled with the words and pictures of people’s lives even though they are still used by millions of people (like Posterous). 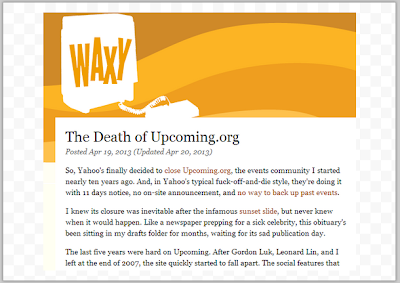 Recently, Yahoo gave its users only 11 days notice that they there shutting down Upcoming - a community events service that they had been around since 2003 - and provided no way of exporting their work. 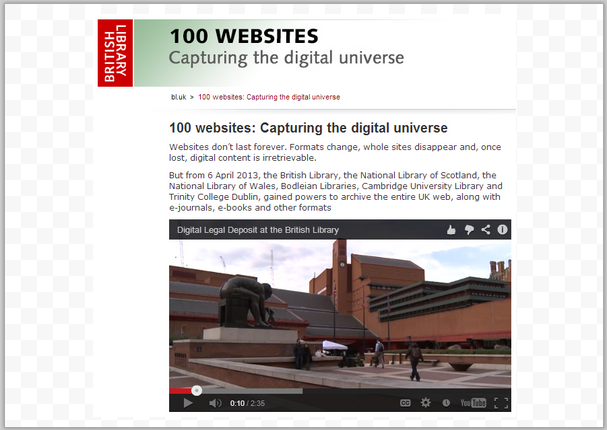 The first web crawl -- of 4.8 million websites with more than a billion pages -- will be complete by the end of 2013 and will be made available to researchers, along with tens of thousands of ejournal articles, ebooks and other materials. Most sites will be crawled once every few months, but between 250 and 500 key rapidly-refreshing sites (such as newspaper websites) will be crawled on a daily basis (although that information won't be made available to members of the public until at least a week after publication). 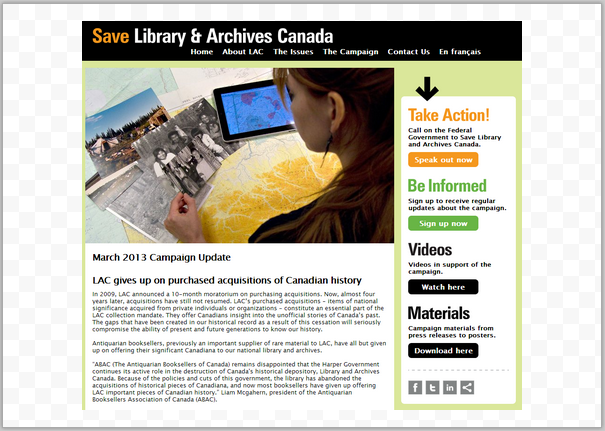 The cuts to services at LAC were justified by promises that digitizing LAC’s material and online access would make up for the deficiency of on-site services. But this argument is facetious once you know that the cuts in question reduced their digitization staff by 50%. 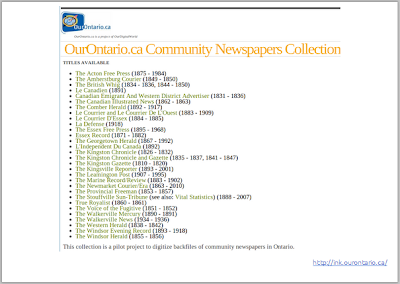 It is difficult to envision a future in which LAC will be able to archive the websites in Canada, when LAC internal estimates indicate that approximately 0.5% of LAC holdings (both textual and non-textual) have been digitized to date. So we can't look to our National Library to save our websites for us. Who can we look to? I don't know. 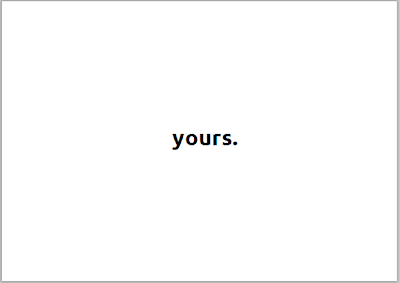 Right now, there's no one. 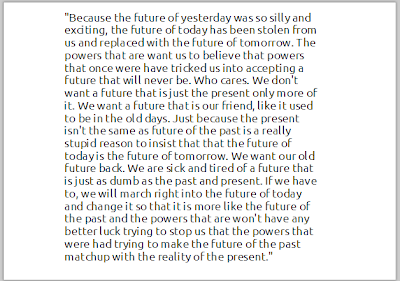 So it is up to us to save our past for our future. 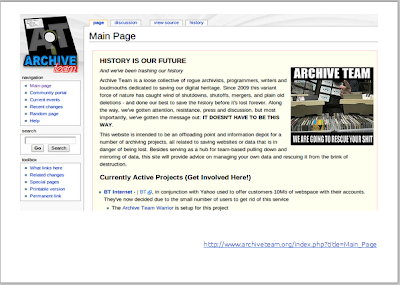 If you are interested in joining a group of citizens - including myself - who are saving our digital heritage, may I suggest that you go to ArchiveTeam.org, and install the "Archive Warrior" on your computer and have it run in the background. It will help download and save work on the project of your choice on behalf of the ArchiveTeam. It was the ArchiveTeam who ended up saving Upcoming, as well as Posterous, Geocities, Friendster and many other free sites and services that we sort of thought would always be there until they were gone. Story Five: The Last Story! If you buy a printed book, the first sale doctrine allows you to pretty much anything to that book - other than to copy and sell additional copies of that book, of course. 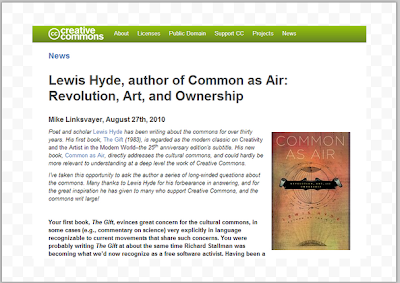 As Lewis Hyde reminds us, with a printed book, "You may return to it multiple times, read it to your child, copy bits into a journal, give it to a friend, loan it to a student, sell it to a stranger... the copyright owner's control ends at the point of purchase." But the first sale doctrine applies does not apply to ebooks. So instead of relying on the doctrine of first sale to make available print books to the public, now libraries have to negotiate licenses to do the same with ebooks. And to prevent these books to be posted online for the world at large, publishers have embedded ebooks with DRM (digital rights management) software which allow the ebooks to blocked from cutting and pasting, from being copied to another person, and to even self-destruct after a given period of time or views. And there are many consequences to this shift including some that we probably haven't even experienced or understood yet. 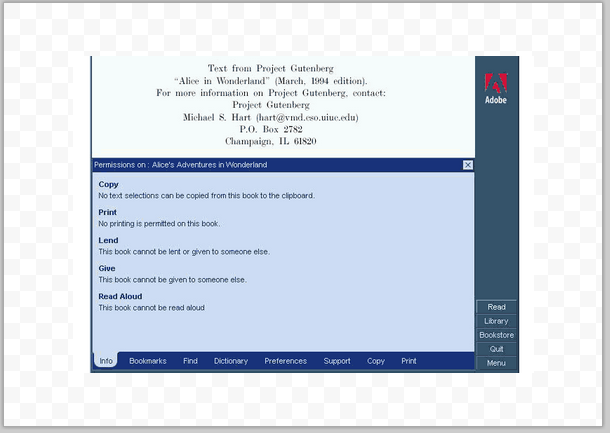 How can libraries preserve ebooks across generations when it's illegal to tamper with DRM software? What happens when a reader's annotations are locked into a proprietary platform like Amazon's? 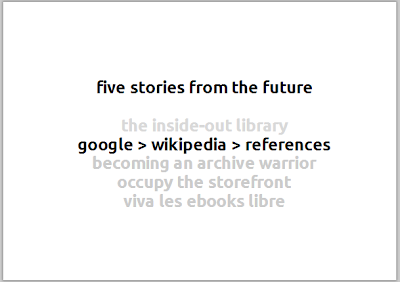 What is the long term impact of text being separated from the corpus and the activity of the Internet? 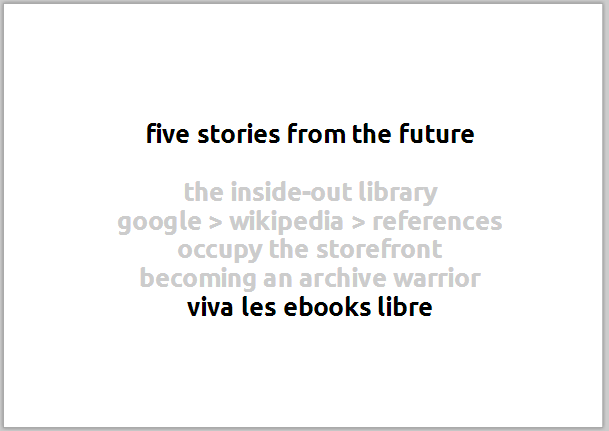 But why are we accepting this crappier future of books and reading? 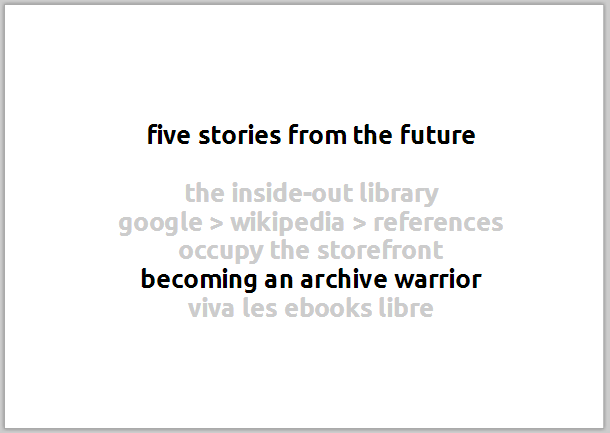 And not entirely unrelated, what happened to the future of the past that was exciting and worth looking forward to? We need to break out of this future of text trapped in amber. 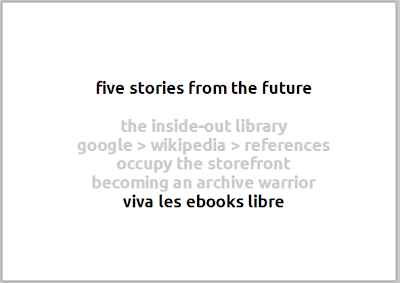 Here's a vision of the future of ebooks from someone many consider a visionary, including myself. Explorable Explanations is my umbrella project for ideas that enable and encourage truly active reading. The goal is to change people's relationship with text. 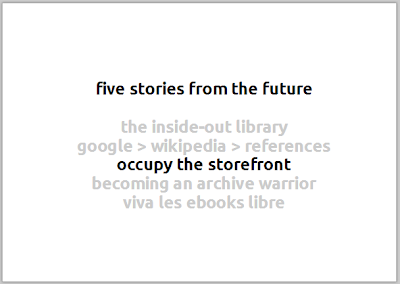 People currently think of text as information to be consumed. I want text to be used as an environment to think in. 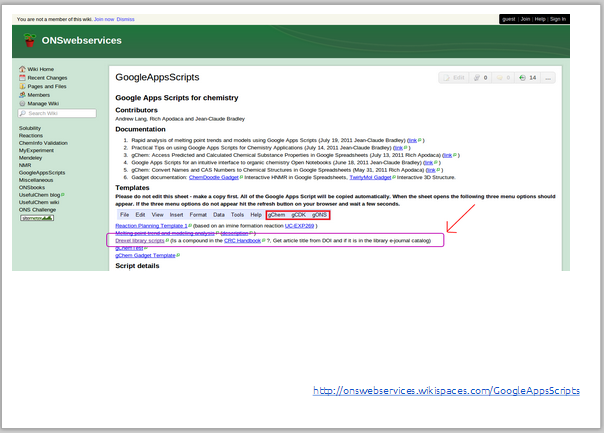 Bret Victor has already built the scripting tools that make such reactive documents already possible. And there are other tools available. 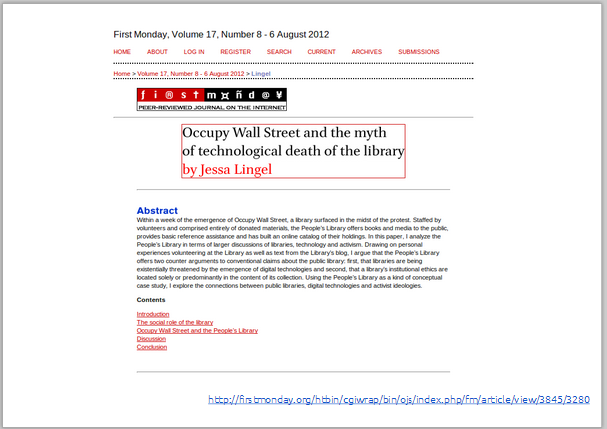 The library is embedded into the document. 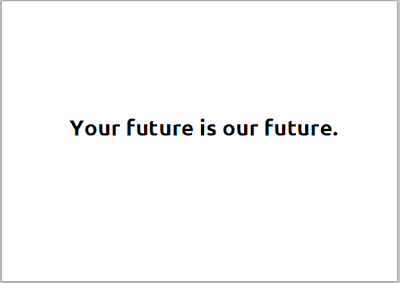 What I'm trying to say is this: Your future is our future. Help people build their own libraries. 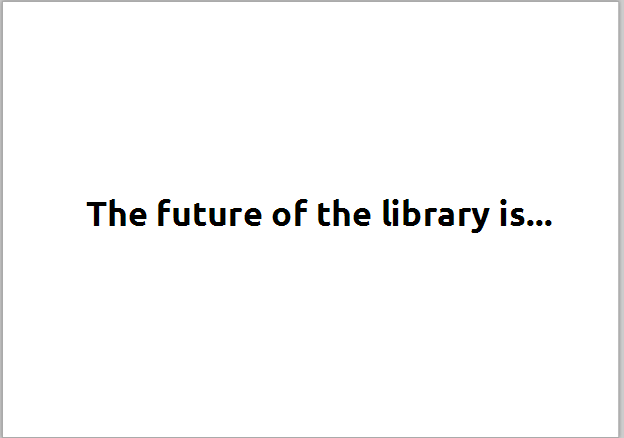 By helping others build their own libraries, we will ensure that the library of the future will take many shapes and many forms and thus give us more reasons to have hope that our shared future will have libraries. 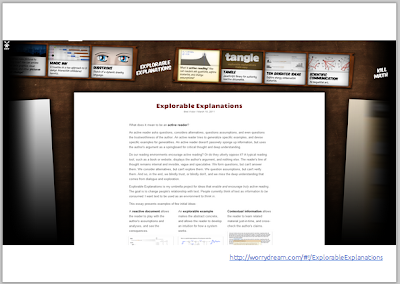 This is an amazing presentation. You should give it more places. 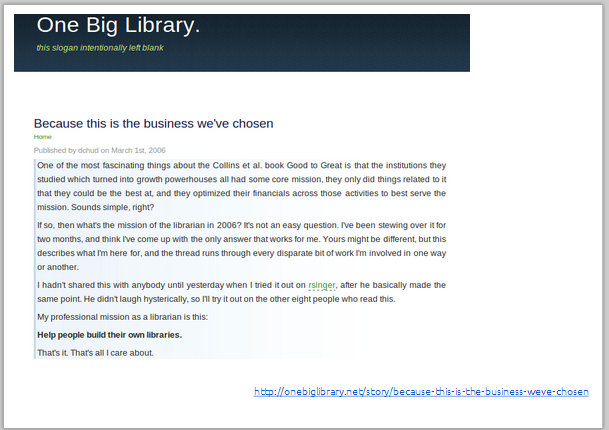 One thing it made me think of (and really a side track to your points, which I don't mean to detract from, this is just an associated tendril)... "instead of being concerned with lending, libraries made the shift to sharing?" -- i've been thinking for a while that a potential project that would make a lot of sense for public libraries is "Bring us your old photos in shoeboxes and home movies on VHS and 8mm film, and we'll help you digitize them, and put them in the online community archive where we'll preserve them for future generations." Although there's "would make sense", and there's "can possibly get any funding or find the resources or expertise to do", not always related. And I do very much like your idea of digitizing service for a community. 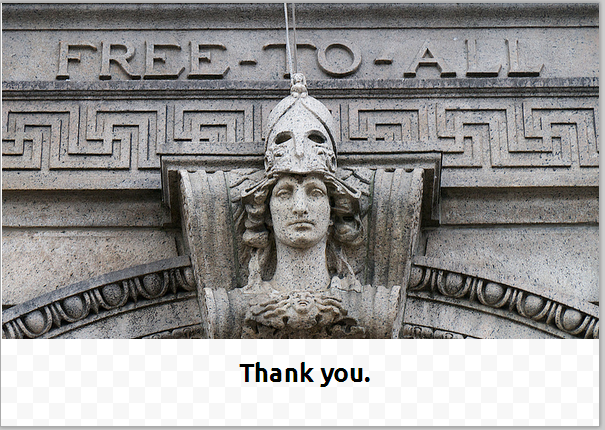 I think the community support for the library would grow as the the project would progress, because all of a sudden, the library would become a personal place that contains a part of us that would remain for others even after we are gone. Well said, Mita! 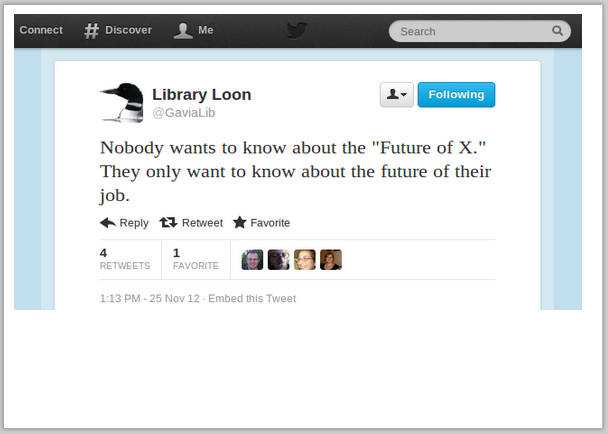 Indeed, being what/were people need accurate information/services defines what "libraries" are. In response to " jrochkind"... We (AppleSPICE - the regional MAC computer club) have done a Saturday "community digitization day at the public library once already, and are planning a second... we roll in with all the laptops, cameras and scanners needed... and club members confortable with the gear who are willing to volunteer time (some of us are even librarians!). A busy, story-filled day with much laughter and some touching memories. noticed this through Mike Ridley. Good stuff, just don't be too hard on Canadian libraries. There is more innovation there then many other places. I know this is an old article, but I was only recently pointed to your site (and added it to my lunch-time reading). Great presentation, and with you up to the DRM section. This is normally where I part ways with people in these discussions. Take a look at http://c11.ca/brief for what I submitted to the government for Bill C-11. Idea: "Content" can't make the decisions people attribute to DRM such as disabling cut-and-past, etc. Content is passive. All those decisions are encoded in software running on hardware. In my mind it is the rights of the owners of the hardware that should be prioritized over the desires of third parties such as copyright holders. From the perspective of these owners, a non-owner digital lock on their hardware is a direct infringement of their rights. Encryption on content which requires the use of a non-owner locked device to access is a secondary infringement. This puts DRM infected e-Book publishers as being secondary infringers just like the Pirate Bay or ISOHunt, and companies like Apple and Sony as direct infringers. (Note: I can't think of a good comparison given there isn't the level of for-profit infringement of copyright as there is for IT property rights). Unlike the Pirate Bay, these direct and secondary infringers lobby government to fully legalize and legally protect their infringements of other peoples property rights. I know this is a different perspective, but one I wish more people understood. I understand the anger that some copyright holders have about infringement given I have the same emotions when confronted with direct and secondary infringements of my IT property rights. Questions for libraries become different when we move to the 4-stakeholder (copyright holder, user, software author, hardware owner) from the 2-stakeholder (copyright holder vs user) understanding of DRM.